Admixtures are natural or artificially manufactured chemical substances which are mixed with the concrete before or during mixing to enhance its properties. 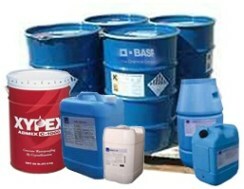 Commonly used admixtures of concrete are air entraining agents, water reducers, retarders and accelerators. Why Admixtures of concrete are used? Admixtures of concrete are used to enhance or give new and special properties to concrete. Admixtures are used to enhance durability, workability or strength characteristics of concrete. They are also used to overcome difficult construction conditions, such as hot or cold weather concreting, pumping requirements, early strength requirements and low water-cement ratio specifications. Your ready mixed concrete supplier can tell you about admixture(s) that may be appropriate for your specific application. Admixtures of concrete are assessed for compatibility with concrete mix, construction practices, job specifications and financial benefits before they are used. The table below shows recommended percentages of air content as specified by ‘Building Code Requirements for Structural Concrete, ACI 318, American Concrete Institute’. Air-entraining admixtures are liquid chemicals which are added to concrete mix during batching. These admixtures introduce very tiny air bubbles in concrete also called air entertained bubbles. These air bubbles increase the concrete’s resistance to damage caused by freezing and thawing. In fresh concrete mix, entrained air increases workability and reduces bleeding and segregation of concrete. 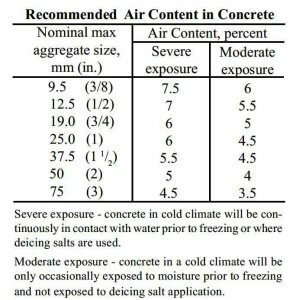 A normal air content of 4% to 7% of the concrete volume is specified for exterior flatwork (parking lots, drive-ways, sidewalks, pool decks, patios) that is subject to freezing and thawing cycles. This percentage depends on the size of coarse aggregate (see Table below). Air entrainment in concrete is not necessary for interior structural work since it is not subject to freezing and thawing. In rich cement content concretes, entrained air reduces strength by about 5% for each 1% of air added. However in low cement content concretes, adding air has less effect on strength and may even cause a little increased strength due to less water demand for required slump. Air entraining admixtures should meet the requirements of ASTM C260/C260M titled ‘Specification for Air-Entraining Admixtures for Concrete’. The table below shows recommended percentages of air content as specified by ‘Building Code Requirements for Structural Concrete, ACI 318, American Concrete Institute’. 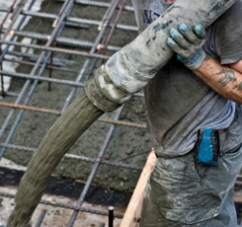 Water reducers are used to lower the water content in fresh concrete and increase its strength. These are also used to get higher slump while reducing water addition. These admixtures scatter the cement particles in concrete making cement more effective. This dispersion of cement increases strength and also reduces cement consumption while achieving same strength. Water reducers are used to increase slump of concrete with less or no water addition which is useful for pumping concrete in hot weather thus assist in placement of concrete. Water reducers should meet the requirements mentioned in ASTM C494/C494M titled ‘Specification for Chemical Admixtures for Concrete’. Mid-range water reducers are also commonly used now a days which improve the finish of concrete flatwork while reducing greater amount of water addition. Retarders are chemical admixtures which increase the initial setting of concrete usually by an hour or more. Retarders are generally used in hot weather to reduce quick setting caused by high temperatures. Retarders are used to allow more time for placing and finishing of fresh concrete. Most retarders also act as water reducers. Retarders should meet the requirements specified in ASTM C494/C494M titled ‘Specification for Chemical Admixtures for Concrete’. Accelerators are the admixtures which reduce the initial setting time of concrete thus giving higher early strength. Accelerators are also used in fast track construction projects which require early formwork removal of structures opening to traffic or load application. Accelerators should meet the requirements specified in ASTM C494/C494M titled ‘Specification for Chemical Admixtures for Concrete’. There are two types of accelerators. Chloride based and non-chloride based. Calcium chloride is one of the most effective and economical accelerators which is available in powder and liquid form and it must meet the requirements of ASTM D98 titled ‘Standard Specifications for Calcium Chloride’. 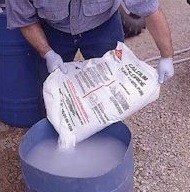 Calcium chloride can be used up to 2% by the weight of the cement for non-reinforced structures. As the steel in reinforced concrete can be corroded by chloride, lower percentages of chlorides are added to reinforced concrete. Pre-stressed concrete and concrete which have embedded galvanized metal or aluminum should not contain any chloride-based accelerators as these metals can easily be corroded with chloride. If there is concern of corrosion of embedded metals or reinforcement in concrete then non chloride based accelerators should be used. High range water reducers are also called super plasticizers. These admixtures reduce the water content of concrete mixture to about 10 and even up to 25%. HRWRs are therefore used to increase slump thus producing “flowing” concrete with a little or no addition of water. These admixtures also greatly increases structural strength of concrete and are necessary for high strength and high performance concrete mixtures which have higher contents of cement. HRWRs greatly increase slump of a given concrete mixture. Adding HRWR to a concrete with a slump of 3 to 4 inches (75 to 100 mm) can produce a concrete with a slump of about 8 inches (200 mm). High range water reducers or super plasticizers should meet the requirements specified in ASTM C494/C494M titled ‘Specification for Chemical Admixtures for Concrete’. Besides these standard types of admixtures there are some other admixtures of concrete available in market for some special concrete characteristics. These include corrosion reducers, shrinkage reducers, anti-washout admixtures, admixtures to reduce alkali aggregate reactivity, pumping aids, damp proofing admixtures and a range of colors and products which enhance the aesthetics of concrete.